It’s back-to-school season, which means it’s time to stock up on gear. The upside of digital devices like smartphones, e-readers and tablets invading the classroom is that they’re replacing the 20 pounds of textbooks that students would normally carry on their backs. The bad news is that, unlike the dead tree versions of books, these items are battery-operated and require constant recharging. So, for this week’s review I took a look at some battery-charging products that can juice up multiple devices while you’re carrying them in a backpack or laptop bag. I mainly focused on the portable myCharge, made by Michigan-based RFA Brands. This multipurpose battery pack launched Aug. 1, and is available in a variety of colors and prices, from $50 to $100. The one I tested, the myCharge Peak 6000, is at the high end. RFA also makes Powerbags that come with built-in packs for juicing up your phone and tablets. The ones I tested — a messenger bag and a backpack — cost $140 and $180, respectively. At two-and-a-half to three pounds each, the Powerbags were too heavy and bulky for my everyday use, and I discovered that they charge certain devices at a snail’s pace. The portable myCharge, however, was more useful. Unlike some countertop power-pack solutions with tentacle-like wire attachments, the myCharge was light enough to throw in a bag to create my own homemade Powerbag. And when I was carrying around multiple devices, I found a myCharge to be much more helpful than something like an attachable battery pack for a phone. It’s important to note, though, that none of these products charge laptops, which might be their biggest drawback. 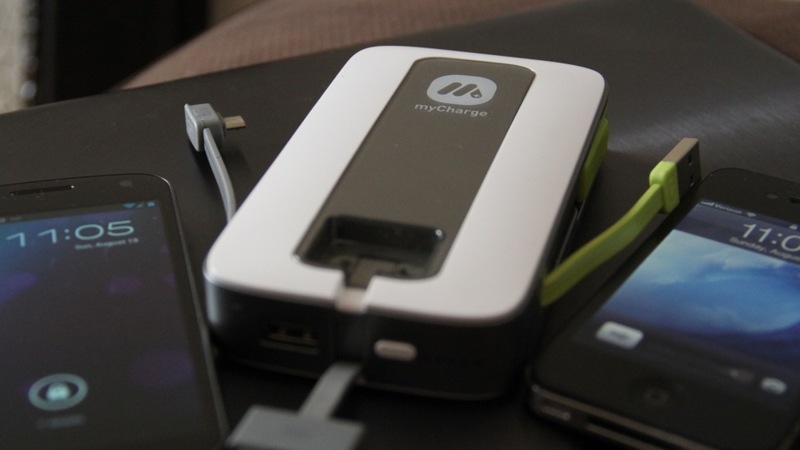 The myCharge Peak 6000 is named as such because it’s a 6,000 milliamp (mA) battery pack. That means it can charge an iPhone four times in a cycle before the myCharge itself needs to recharge. If you charge two devices at once, it cuts those charging claims in half. The myCharge can actually charge up to three devices at once, with little rubber arms that hold micro-USB, USB and Apple connectors, in addition to its USB port. It works with iPhone, iPod, iPad, BlackBerry and an assortment of other phones. While it is compatible with the new iPad, it won’t charge it very well, due to discrepancies in milliamps. The myCharge casing is made of glossy white plastic with gray sides and a matching strip down the middle. Overall, the device measures 4.25 inches by 7.25 inches, is 2.5 inches thick and weighs half a pound. All of the charging connectors snap in and out of the device, keeping it compact and free of wire tangles. Even the device’s own AC wall plug is wire-free and tucked into the back of the myCharge. While the myCharge Peak 6000 packs a lot of power, it isn’t super-speedy. When I charged my nearly-dead iPhone using the myCharge Peak 6000, it took nearly two hours to get to 100 percent, longer than it would normally take to charge my phone when it was plugged into a wall outlet. I found that I used the myCharge more often when I was looking for a quick boost on the go. When I was home, I would still plug my devices into a wall outlet. I really liked the myCharge’s new voice notifications, which the earlier version of the 6,000mA myCharge lacks. It told me how much power the myCharge had, and acknowledged when I plugged in different devices. It also told me when the myCharge itself needed to be charged. One drawback of the myCharge is that you can’t charge two of the same devices simultaneously without carrying a cord. So, when I was charging my iPhone, I could only charge an iPad 2 via the USB port on the myCharge. When I created a makeshift Powerbag one night by tucking the myCharge in my purse, my dinner companion and I couldn’t both charge our iPhones. However, I could charge an iPhone at the same time as I charged a Kindle, or a Samsung smartphone, via micro-USB. And with the myCharge, the Galaxy Nexus charged much more quickly than it did with the Powerbag. The $140 Powerbag messenger bag contains a 3,000mA battery pack that can charge four devices at once. It has micro-USB, mini-USB and 30-pin connectors — the proprietary plugs for Apple devices — as well as a spare USB port. It has some style, and smartly weaves charging cables through the bag. When I plugged in my 50 percent-charged iPhone, it fit neatly into a small pocket in the bag, and by the end of a hour-long business meeting, the phone was charged. The Powerbag backpack offers the same connectors, and contains a more powerful 6,000mA battery back. But it has so much unnecessary bulk that I doubt anyone would be the cool kid in school — or the office – with this bag. I carried it to a tech event here in New York City and, while I appreciated the extra source of battery life, I found it to be just as cumbersome as the backpack I usually use for carrying my professional camera gear. In my experience, the Powerbags charged one of my test phones — a Samsung Galaxy Nexus — at an incredibly slow rate. After more than an hour of charge time, the initially-drained smartphone had charged 33 percent. RFA Brands says that even though the Powerbags come with 6,000mA and 3,000mA batteries, they only deliver a 500mA current (comparable to charging from your laptop via USB) to tablets and other newer devices, including the Samsung Galaxy Tab and the phone I tested. This results in slower charging. Also, while the Powerbags are compatible with all Amazon Kindles and the Barnes & Noble Nook e-reader, as well as the original iPad and iPad 2 — they won’t fully charge the new iPad, due to the new iPad’s high-milliamp battery. While I wouldn’t recommend investing in the Powerbags, the myCharge Peak 6000 is a solid device with multiple charging options, ideal for regular travelers, business people shuttling to and from meetings, or students looking to charge those digital devices for class.